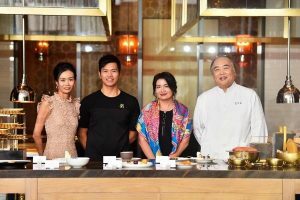 SHANGHAI, CHINA and MCLEAN, Va., Sept. 13, 2018 Waldorf Astoria Hotels & Resorts, the iconic luxury brand of Hilton (NYSE:HLT), announced on September 12 the debut of an exquisitely curated seven-course French menu inspired by Chinese imperial cuisine at Waldorf Astoria Beijing. The luxury hotel brand, which began in New York City with a single property in 1893, has been a century-old symbol for timeless luxury and culinary excellence around the world. Credited as the birthplace of iconic culinary inventions such as the classic Waldorf Salad, Red Velvet Cake and Eggs Benedict, culinary expertise continues to be a key component of today’s Waldorf Astoria brand. Originally from Malaysia and passionate about French cuisine, Chef Addison spent over 14 years working with world-renowned French chefs and Michelin-starred restaurants around the world. At Li’s Imperial Cuisine, Chef Ivan continues the recipes and time-honoured cooking methods originated by his great-grandfather, Li Shunqing, who oversaw the imperial kitchen in the Forbidden City during the Qing Dynasty. 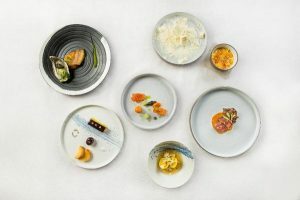 “East-West fusion cuisine is one of the food industry’s big market trends, and this partnership has given new meaning and flavour into traditional French cuisine. As a member of the Waldorf Astoria culinary team, I am proud to be part of this collaboration with Chef Ivan to create such a culinary delight for our diners.” said Chef Addison. The seven-course set includes highlights such as an Auspicious Jade amuse bouche with New Zealand King Salmon in “Balik” style with Scallop Paste, Ocietra Caviar and Sea Urchin as a modern interpretation of one of Empress Dowager Cixi’s favourite dishes, as well as a Classic Duck Foie Gras Terrine starter with Port Wine and Cherry Marmalade inspired by Emperor Qianlong’s favourite duck liver recipe and served with crispy “Man Tou” from northern China. Other reinvented dishes include a Four Ministers Consomme with Britany Blue Lobster, Nostoc, Fish Maw and Winter Melon, a Kinki and Oyster Temptations with Japanese Kinki, Buchot Mussel and Smoked Ancelin Oyster, and a Duo of Venison featuring what was considered as one of the most precious ingredients back in the Qing Dynasty — venison saddle and tendon served with Autumn Mushrooms in a Royale sauce. With a sumptuous pre-dessert of Wuliangye’s Blessing, a classic Creme Brulee made with China’s favourite Baijiu (Chinese white spirit), bird’s nest and Osmanthus Flower as the twist, the final flourish to the exceptional menu is a dessert of Waldorf’s Ruyi, a baked mild cheesecake with Yoghurt and Liquid Nitrogen “Frozen” Yuzu. The innovative French menu inspired by Chinese imperial cuisine represents yet another new milestone in line with the Waldorf Astoria brand’s legacy of culinary expertise. Since the brand’s entry into China, the three Waldorf Astoria hotels in Beijing, Shanghai and Chengdu have also become iconic landmarks in the world of culinary journeys, serving the discerning tastes of their international clientele with authentic and unforgettable gastronomic experiences.